First, if you have wondered what has happened to my blog posts, I've been working hard on a fundraiser for the Moore Public Schools. It has taken quite a bit of time over the past few days, so my posts have temporarily slowed down. I will post more about the fundraiser when I have more details I can share. Second, I have spoken to a number of people who have been in Moore to help out - whether it's those who are there to clean, those who are working to make things safer, or those reporting on what's happening. I have been giving them restaurant recommendations one at a time. In an effort to be helpful, I'm going to post all my recommendations here. If you have a place you'd like me to add, send me a note or leave a comment. Or, if one of these places is no longer in business for whatever reason, please let me know. Keep in mind that these are places that I ate at when I was still in high school. The food is simple, but it's tasty and local. Del Rancho - Go to the one in Moore. 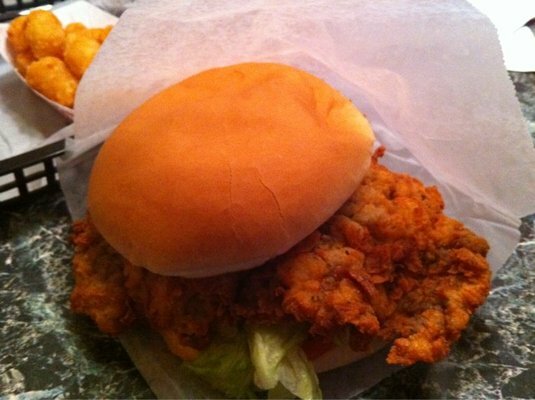 Get the chicken fried steak sandwich supreme and the cherry limeade. Grandy's - This is a good alternative to something like McDonald's if you need fast food. I always enjoyed the chicken nuggets and the rolls. If you eat inside, they bring you unlimited rolls. I also seem to remember them having an amazing sweet tea. Braum's - I really enjoy the ice-cream here - especially a caramel pecan sundae. Be sure to get nuts and whipped cream too. They also have a decent breakfast - my favorite is the breakfast yogurt or the biscuits and gravy. Sonic Drive In - This place exists everywhere, but I'm putting it on the list because it's based out of Oklahoma City. Most kids who grow up in OK are hooked at a young age. We will also travel long distances to find one when we're living far away from home. Harry Bears - They are a sports pub of sorts. It's very casuel - like a Chilli's. I recommend one of the burgers with shredded cheddar cheese on it - and definitely try the fried peaches for dessert. Cattleman's - If you enjoy steak and you want to check out the stockyards in OKC, go here. Irma's Burger Shack - A diner with great burgers in downtown OKC. Kaiser's - A little ice cream place in downtown OKC. Van's Pig Stand - Wow. I can no longer recommend this one as I see from the Van's website that the Moore location was destroyed. Sad! If you make it to Shawnee, there's another location where you can try the barbecue and rum ice-cream pie. My friend Jamie also recommended a number of other places that I haven't had a chance to try. Nic's - They're famous for their burgers. They were on Diners, Drive-Ins, and Dives. S&B Burgers - More great burgers! Iguana Mexican Grill - Jamie says this Mexican place is awesome. Salt Grass Steakhouse - Jamie also highly recommends Salt Grass for steaks. Moore Public Schools is holding three graduations today for their high school seniors. Westmoore High School's graduation was this morning at 9:30 AM, Southmoore's is at 2:00 PM, and Moore's is at 6:00 PM. Companies have generously donated caps and gowns for students to wear during the graduation ceremony. This is the family that owns the farm where I rode horses growing up. As I mentioned in a previous blog post, Celestial Acres was completely destroyed and it's estimated that something in the neighborhood of 100 horses died there this week. Below is a request from that family, asking for assistance with cleanup on Saturday, May 25th (tomorrow). Here's the information that was posted on the Orr Family Farm's Facebook page. The streets are finally open and we can accept help from volunteers. We are asking for folks who want to help us clean up to arrive at the Orr Family Farm, TOMORROW, Saturday, MAY 25 beginning at 8 a.m. Please enter the Farm from Western Avenue and park in the main parking lot. 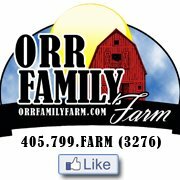 Place a sign on dashboard that reads "Orr Family Farm"
Also, if anyone is a restauranteur and would like to help with provisions for lunch, we would love to have that help. We do have water and some light snacks, but lunch would help us and of course all of the wonderful volunteers who we expect on Saturday. If you are interested in providing lunch, please call 405.609.7068. Once again, we can not thank you all enough for your thoughts, prayers and well-wishes during this difficult time. Thank you. This story makes me smile. I've been wanting to share it before now, but I held off because I knew that Lauren Squires was going to cover it tonight on the WMC-TV news in Memphis. As folks in Moore know, there's a Dan McGuinness on 19th Street in Moore. It was opened by a couple who are from both Moore AND Memphis. Michele is from Memphis and Jim is from Moore. They both used to live in Memphis and opened the bar in Moore about 7 years ago. When they opened the bar, a number of the employees from the Dan McGuinness here went with them to open it. They even have a table in the bar that came from the old Dan McGuinness in Downtown Memphis. Whenever I go home, I visit this bar. In fact, I have a friend from Memphis who I met at the Dan McGuinness in Moore when he was working in Moore. He has since moved back to Memphis. I've also met employees at the Dan McGuinness here in Memphis who know my high school friends. I can only assume that they worked at the bar in Moore at some point. Check out Lauren's coverage of Dan McGuinness in Moore by clicking below. Below is a photo of the pub that was posted on Facebook. Well, this has been quite a week! Memphis is continuing to bring me photos back of my parents through the media. My parents were interviewed earlier today by Memphis newspaper, The Commercial Appeal. In particular, Tom Charlier was most interested in their safe room. When they built their home a few years ago, my parents didn't opt to install a shelter. They just installed their safe room about a year ago. When Tom initially called me, I gave him the basic facts and put him in touch with my parents. A few hours later, my phone rang again. It was Tom. He had already met my parents, interviewed them, and had taken photos at their house. I wasn't sure what he might need. He said, "So your parents say that they installed the safe room because you wouldn't stop pestering them about it. Can you tell me about that?" I just had to laugh. I would never share that detail with any news reporter on my own. I explained that I had really pushed them to install a shelter. My childhood home is not as close to the path of the tornado and their new home is in the direct path. It's hard enough to be that close to the tornado, much less to not have a shelter. Anyway, you should click here to read the article yourself. I just realized - there's also a video of them demonstrating the safe room below the top photo. Update - the article was also reprinted in the Naples News in Florida. It's a slightly different version with different photos and no video. Here's the link. Lush Fashion Lounge, a store in Oklahoma City has partnered with a local designer to create a t-shirt to support the tornado survivors. T-shirts will be $25 and 100% of the sales will go to tornado relief. Get yours by visiting their store or by calling them. Pre-orders are available by calling 405-936-0680. They will ship for free! Here's another story from Memphis. 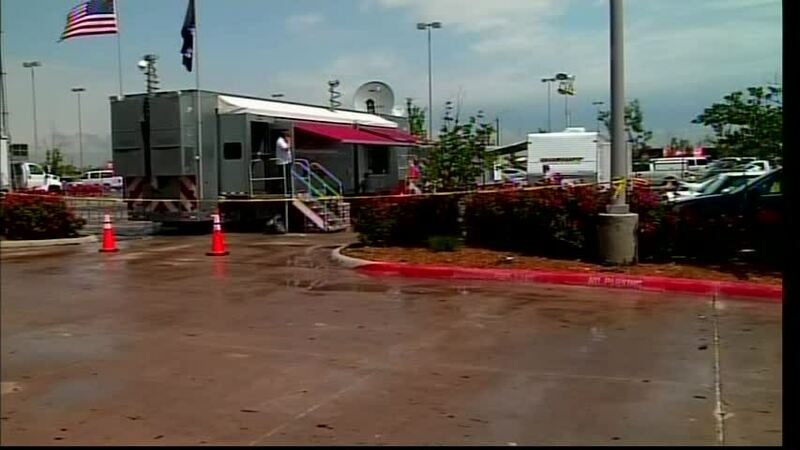 Verizon Wireless has stepped into help those in Moore. They are doing everything they can to ensure those in Moore can make calls out. As someone who relies totally on phone service to check on my friends and family in Moore, I appreciate their help! Here's a link to the entire story and video on the WMC-TV website. I'm so impressed with Diana's daughter Keirstin for providing a teen's perspective on the tornadoes that hit Moore. Keirstin gives Channel One News a walk around their damaged home and a look into their neighborhood. Here's the video of Keirstin. As I mentioned in my earlier post, Keirstin and her mom Diana are in need of many items. Click here to see the earlier post and the list of things they need - and where to send them. 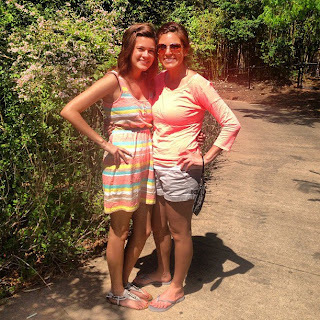 Lauren Squires wrote another important story about the tragedy in Moore for the folks in Memphis. I'm posting it here to share it with those back in Moore. This must have been a hard story to cover, as the first funeral for a 9-year old girl was today. There are also Red Cross volunteers from the Mid-South that are continuing to help with the cleanup in Moore. To read Lauren's story and watch the video on the WMC-TV website, click here. I cannot thank WMC-TV enough for making these stories so personal for those impacted. I just made my donation to the Moore Public Schools. It was so fast and easy - it took about 3 minutes. Make your donation here! Here's what the website looks like. You click that button that says "Donate Now." 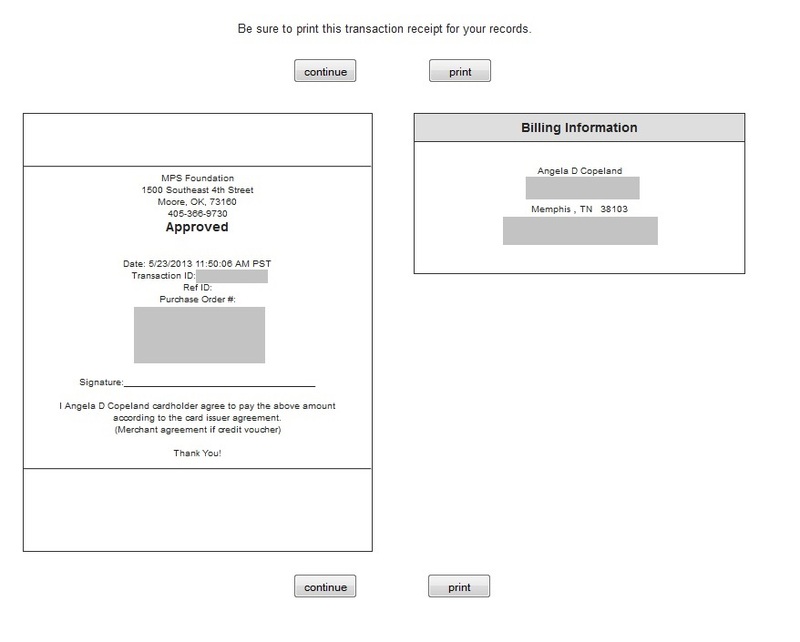 This is the screen you fill out with your credit card information. Here's what the receipt looks like. I've greyed out my credit card information. The Commercial Appeal is also in Moore this week. Tom Charlier is covering the devastation to share with those living in Memphis. Here's a link to the article he published yesterday on the Commercial Appeal's website. Here's the video that the CA has posted to their site. It is a time lapse video of the tornado in Moore. The Moore Oklahoma Tornado Recovery Facebook page asked to share the message below with Blue Cross Blue Shield Customers in Moore. They are helping to replace lost medicines for their members. I was just speaking to Blue Cross Blue Shield of Oklahoma and the representative asked me to pass on a message from them to any tornado victims that are BCBS members. Members should contact Blue Cross (1-800-580-6202) if they have lost any medications or medical equipment, because BCBS will replace the lost meds or equipment free of charge. If you could pass this along, BCBSOK would appreciate it. Thank you. I've done my best not to include names or details of my friends who have lost their homes to protect their privacy. I think now is the time though to share those details as many of them need help. 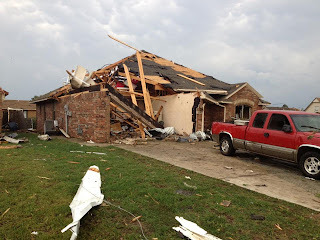 My friend Diana (Medina) Bracelin's house was hit hard during the tornado this week in Moore. It's a total loss, so there is nothing left for Diana or her family. Diana is supporting two children: her daughter Kirsten who is 18 and her niece who is 21. Her niece had just moved to Moore from Louisiana to attend college at the University of Central Oklahoma. I have known Diana since I was 5 years old. We were in the same kindergarten class at East Hills Elementary School in Moore, and went all the way through high school together at Moore High School. East Hills was a warehouse building that was temporarily converted into a school. These three women are in need of help. Below is a list of the things that Diana needs to keep her family afloat. Diana, her daughter, and her niece are currently staying at her sister's house. Below is the address where you can drop off or mail any items. If you stop by, please give her a hug for me! 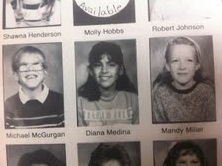 Here's a photo of Diana from elementary school. 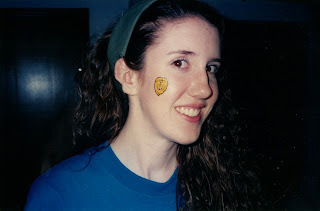 I was hoping to post one from kindergarten, but I've miss placed that yearbook. Here's a photo of Diana with her daughter Keirstin in happier times, just a few weeks ago. Here are photos of Diana's house since the tornado moved through Moore. If you are interested to help an individual, this is a great way to do it. I know that Diana and her family will appreciate your help! 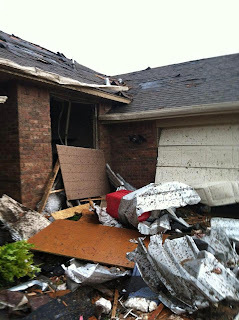 In case you missed it, I'm re-posting the video of the damage in Moore that aired last night on WMC-TV in Memphis. At the end of the video, Lauren Squires mentions donating to the Moore Public School district. I would highly encourage you to consider donating. The Moore Public Schools is a wonderful district full of great teachers who really help the kids. I attended Moore schools from kindergarten to twelfth grade, and can speak personally about the difference it made for me. If you would like to give, please click here to visit the First American Bank website. You can donate with credit card or by check. It's easy and takes less than 5 minutes. For those in Memphis, I am also working to plan a fundraiser for the Moore Public Schools here in Memphis. If you can help out in any way, please send me an e-mail at angela(dot)copeland(at)gmail(dot)com. Thank you to everyone, especially Lauren Squires, for your support of my hometown of Moore, Oklahoma! I just received this interactive map of the tornado's path in Moore. There are 3 versions: an overall map, a map of Plaza Towers elementary, and a map of the medical center area. If you slide your mouse over the map, it shows the before and after photos - taken from above. The Plaza Towers map is the most startling. It gives you an understanding of what it means to wipe buildings off the map - and the kind of strength a F5 tornado brings. Click the map below for more. Thanks to my brother Chris for sending this! I've been talking a lot on my blog about donating to the Moore Public Schools. Unfortunately, it's been a little hard to do because you had to send in a check via US Mail - until now. Great news! 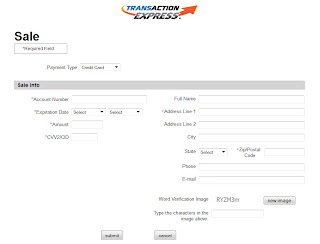 They have put up the online payment option. You can now donate with your credit card online. It's very easy and takes less than 5 minutes. To donate, visit the First American Bank website here, http://www.bankfab.com/donate/, and click on the "Donate Now" button. Wow, this is something I've been looking for, but was not happy to find. I received messages earlier this week that the stables I rode horses at as a child were destroyed. Growing up, I rode a few times a week at Celestial Acres horse barns. From the articles I've seen, about 100 horses died and the barns are now gone. Here's a photo of what's left. Here's one article about the devastation. I'm not going to re-post the other photos I've seen. There are too many photos of dead horses piled up. It's just too sad. My brother Chris e-mailed me this article this morning. You may have seen Love's truck stops along the side of the highway when you've traveled cross country and needed gas. They are based on Oklahoma City and Chris started working for them earlier this year. He was looking for a company with heart, and it looks like he got it! He re-posted this article on his Facebook page with the comment, "Thankful to work for such a great company." To see the original press release on the Love's website, click here. Love’s Travel Stops today announced a $3 million donation to support the immediate and long-term relief efforts in Oklahoma following a devastating tornado that impacted the communities of Moore, Shawnee and surrounding areas. The first $1 million will be designated to the OK Strong Relief Fund established yesterday by Governor Mary Fallin to meet the long-term needs of victims in partnership with the United Way of Central Oklahoma. Another donation of $500,000 will be given to Catholic Charities. The remaining $1.5 million will fund a benefit event to honor those impacted by the storm and to raise additional relief funds. Love’s Travel Stops operates 63 stores in Oklahoma including several in close proximity to the destruction path. Since it's Thursday, I thought I would participate in "Throwback Thursday" by posting a few photos from better days in Moore. 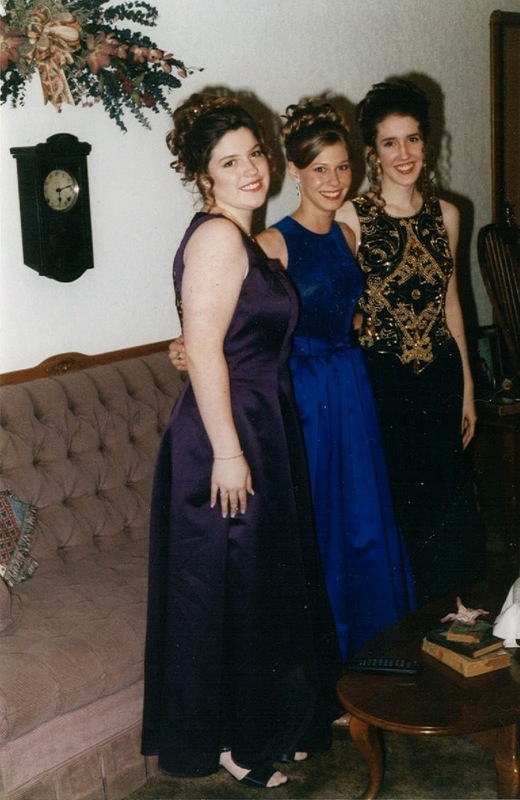 Here's a photo from the Moore High School senior prom. I'm with my friends Carissa and Robyn. This is me before a "Moore War" football game. Football is a big part of the culture in Moore and this was a game between Moore High School and Westmoore High School. After I graduated, a 3rd high school was built and this tradition has changed some, but you get the idea. Around 30,000 people attend these high school games (it's so high that I had to look it up to be sure!). For Moore War, so many people would wear camouflage to these games that the local Army surplus stores were sometimes known to sell out! 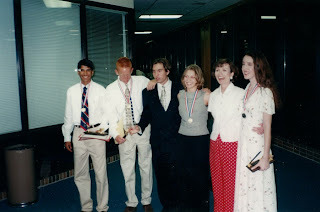 This is at an awards ceremony for Moore High School. I'm pictured with Kyle, Kris, Robyn, and one of our favorite teachers, Mrs. Richardson. 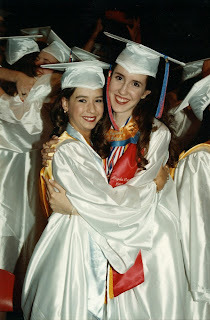 This is me with Kelli during the Moore High School graduation. I love this photo. Our parents weren't allowed to leave the stands to take photos during the graduation. Our class was around 550, so the place it was held was quite large. To get around this, one of my friends came to the graduation dressed as a staff photographer and took photos of us up close during the ceremony. I've always been a bit creative in my problem solving I suppose. 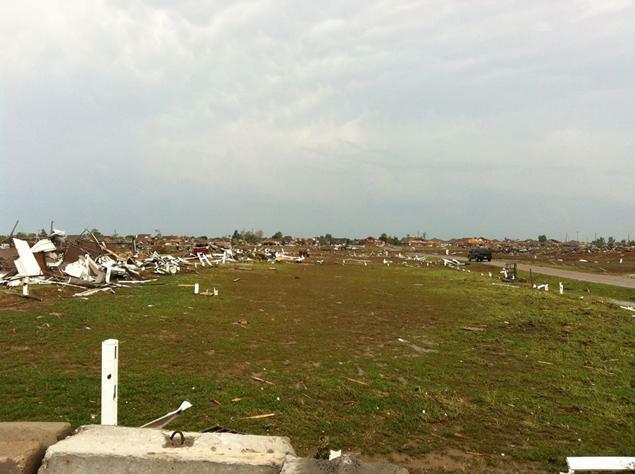 Jaclyn Allen has provided additional helpful news from Moore, Oklahoma. She talked to a teacher today who protected her students by covering them with her own body. If you would like to donate to Moore, I would encourage you to consider the Moore Public Schools. It's teachers like this that make the school system so great. Below is the information to donate. I found a great video that explains Moore, Oklahoma. As a 6th generation Oklahoman who grew up in Moore for the first 18 years of my life, this video could not ring more true. Big thank you to Kristy Sinsara for creating this video! I hope you enjoy it as much as I did. You've probably seen it on the news, but I wanted to share the path of the Moore tornado with you. 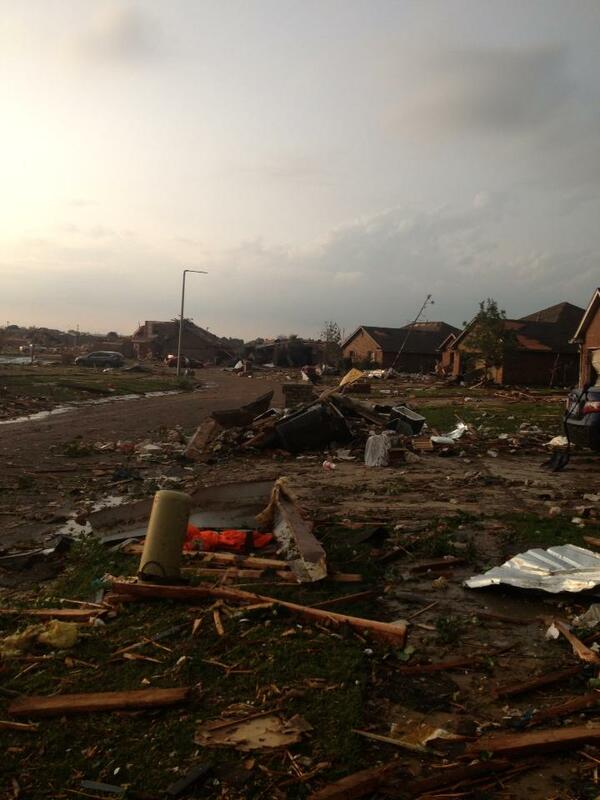 The photo below shows the 17-mile path through Moore that the tornado took. You can see I-35 running north and south near the right side of the photo. The little red flag at the top right of the screen is my parents house. As you can see, they were right in the middle of the damage. 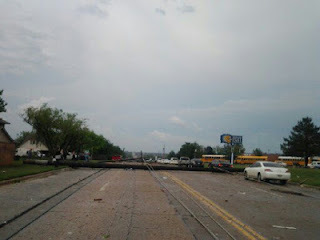 If you missed my blog post yesterday, here is a video of the damage in this area. In my previous post, I provided information on donating to those in Moore. Click here to learn more. 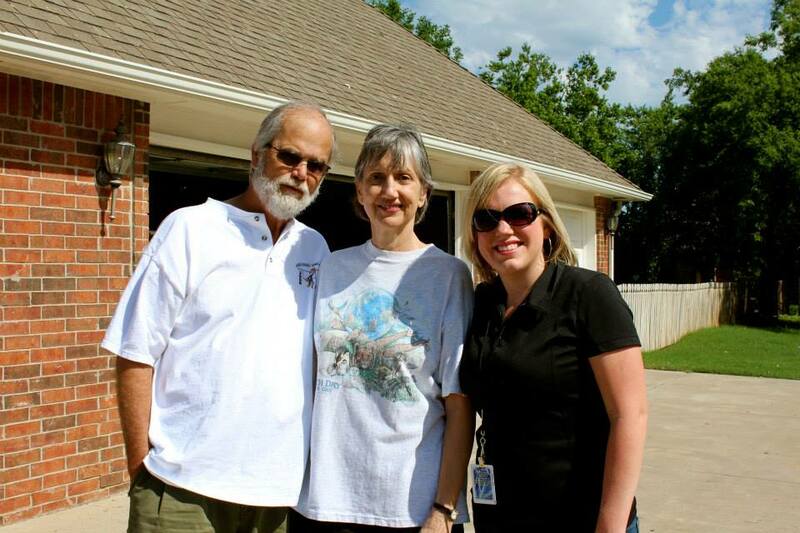 The video of my parents and my neighborhood in Moore, Oklahoma has been posted on the WMC-TV website. Below is a link to the video. If you would like to give, please send a check to the address below. Soon, there will be information about how to donate online. When it is available, I will post it here. Those in Memphis were able to see my parents neighborhood tonight on WMC-TV. I cannot thank Lauren Squires enough for covering the damage in my hometown. You are doing such a great job sharing the experience in Moore with those in the Mid-South. When the news video is available, I will share it on my blog. 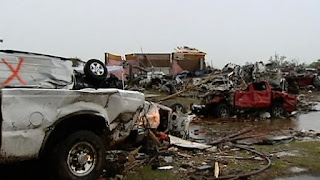 In the meantime, please check out Lauren's article here: http://www.wmctv.com/story/22401820/moore-victim-from-mid-south-lives-near-leveled-homes-flipped-cars. In the article, Lauren mentions that my mom is a retired Moore Public Schools teacher. I was also highly impacted by this amazing school district when I attended kindergarten through twelfth grade there. 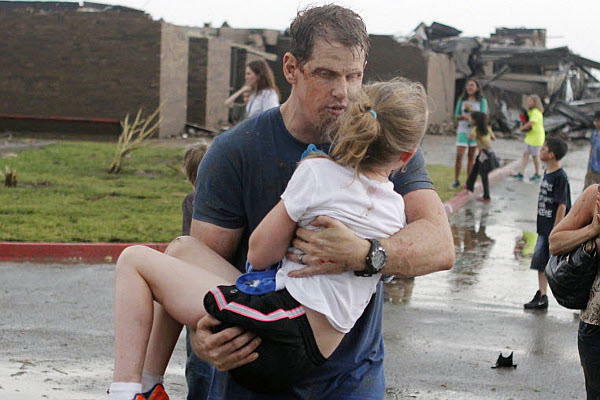 The teachers in Moore made a huge difference in my life and now the district needs your help. Update: You can now make a donation online. Click here to donate via credit card on the First American Bank site. It's easy and takes less than 5 minutes! If you live in Memphis, I am also working to plan a fundraiser for the Moore Public Schools. If you can help out in any way, please send me an e-mail at angela(dot)copeland(at)gmail(dot)com. Thank you for your support of my hometown of Moore, Oklahoma! Below is a photo of my parents, Rick and Vickie, with Lauren Squires. Thank you Lauren for posting this photo! I have really appreciated the outpouring of support here in Memphis, and beyond. People I haven't seen in years have reached out to check on how my family and friends are - and how I'm doing from so far away. 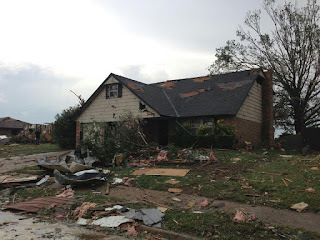 Lauren Squires, a Memphis news reporter at WMC-TV, contacted me last night on her way to Moore to ask about my family. Today, Lauren interviewed my mom (a retired Moore Public Schools teacher) about the devastation in her neighborhood. I haven't seen photos yet, but hopefully I will tonight. Lauren promised to send me video of my street via the news here in Memphis. I will be watching! 10 PM CST tonight on Channel 5. A HUGE thank you to Lauren for stopping by to see my parents. It's so nice to feel the Memphis community supporting my hometown of Moore. I have now learned how to donate to the Moore Public Schools. As you know, the Moore Schools were hit hard during the tornadoes. 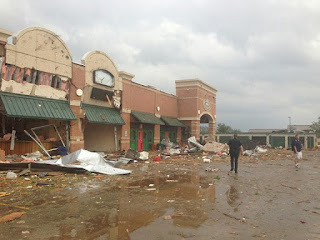 Multiple schools were hit, children were injured and killed, and the school administration building was hit. On a personal note, I went to Moore Public Schools from kindergarten to 12th grade and graduated from Moore High School. 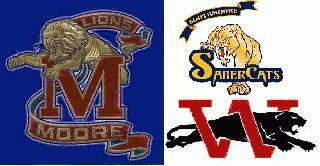 The Moore school district is fairly large with 3 high schools, 5 junior high schools, and 22 elementary schools. I grew up in a divorced family with quite a bit of uncertainty in my life when I was young. 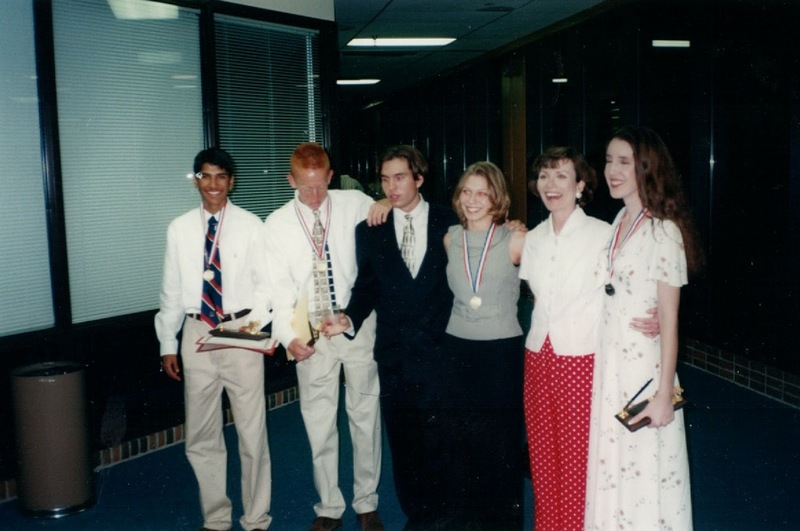 The teachers in Moore worked tirelessly to help me to become the best student that I could be. Their dedication helped me to earn scholarships that allowed me to go to college in New York and put my life on the right path. I give the Moore Schools so much credit for who I have become. I just received a personal call from one of the school board members from Moore Public Schools. She said that the city has enough water, enough work gloves, etc. The victims have places to stay at night. What she said they really need are financial donations for the schools. Moore Public Schools is going to build two new schools this year in addition to all of the repair work that will be required from the tornado damage. There are so many choices when it comes to giving, but I highly recommend donating to Moore Public Schools. The heart of the community of Moore lies in its amazing school system. If you want to give, you can do so by mail at this time. I just received word that the Moore Public Schools technology center was destroyed, so an online donation site is not yet available. As soon as it's up, I will provide that information. If you mail a donation, this is the place to do it. You can designate how you want the money to be used, or you can send a general donation. 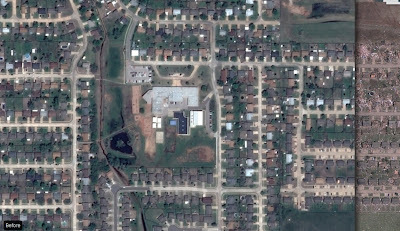 Please note that this address has been updated because Moore Public Schools created a P.O. Box to be used specifically for donations. The previous address will still work; it is the address to send to the school administration building. Here's a link to the website that specifies this address: http://www.bankfab.com/donate/. Jaclyn Allen has posted another news update. Here is a video of her speaking with another family. Jaclyn is a Moore High School graduate who went to college near Moore in Norman, Oklahoma. She is now a news reporter in Denver. I'm still waiting to hear back on ways to donate to Moore Public Schools. It should be around 2 PM CST today when I know more. This morning though, there was a notice posted from Superintendent Pierce. It is posted on the Moore Norman Technology Center website because the Moore Schools website is still down. Below I'm re-posting the letter. For the full version, click here. First, I want to extend my sincerest sympathies to those who have suffered losses over the past few days in Oklahoma, and especially in my hometown of Moore. Our hearts go out to each of you, and know that all of us are suffering with you. Next, we want to thank our emergency responders. Their preparation and quick actions over the past 24-hours have saved lives, and eased the burden of this disaster for all of us. We cannot thank you enough. As superintendent of Moore Public Schools, I want you all to know that safety is our main priority. Yesterday our administrators, staff, teachers, and students put our crisis plan into action immediately. We monitored the weather throughout the day, and when it was time to shelter, we did just that. A tornado’s path is highly unpredictable, but with very little notice, we implemented our tornado shelter procedures at every school site. Throughout the school year, we are required by the state to conduct tornado drills. At Moore Public Schools, we exceed that state requirement. When our children are at school, they are in our care. I want to emphasize that safety is our main priority, and the decisions we make are always with their safety in-mind. I don’t need to tell you that Moore Public Schools, the City of Moore, and south Oklahoma City have suffered a devastating natural disaster. We are in the process of learning as much as we can about what has happened, and are reviewing our emergency procedures. Please keep us in your thoughts as we work to rebuild our community. Classes have been canceled for the remainder of the year. Moore Public Schools will hold graduation for its 3 high schools this Saturday, May 25th at the Cox Convention Center in downtown Oklahoma City. Lauren Squires from Memphis's WMC-TV Channel 5 called me last night as she was driving from Memphis to Moore. She is going to report on the devastation and to share what's happening with Memphis residents. I believe she is headed to my parents house now. I haven't seen photos of their neighborhood yet. 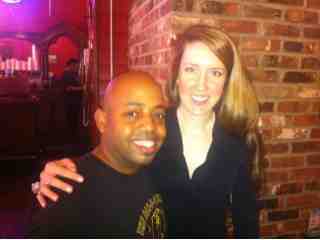 Lauren promised to get some footage to send back to me here in Memphis. Hopefully, we will see that today here in Memphis. Here's her first video from Moore last night when she arrived. Big thanks in advance to Lauren for her hard work! The Oklahoman's website (one of the major news outlets in Oklahoma City) is reporting that the text donations people are making to the Red Cross are not going to the victims in Moore. They are going to an overall Red Cross fund. Please keep this in mind as you give. Donations to local Red Cross Chapter likely will be used for relief related to recent tornadoes. The American Red Cross estimates “several million” dollars has been donated via text messages this week, but the money is not designated to relief efforts in Oklahoma. The American Red Cross estimates “several million” dollars have been donated via electronic text messages since a tornado devastated Moore on Monday, but the money is not specifically designated to relief efforts in Oklahoma. A representative of the local chapter, however, promised money donated to the local organization will be used for relief efforts in Oklahoma. Ann Marie Borrego, spokeswoman for the American Red Cross in Washington, D.C., verified Tuesday that money donated by texting “REDCROSS” to 90999 will instead go toward a national disaster recovery fund. Borrego said some of the money donated via text message may end up being used in Oklahoma, and noted the agency has already sent crews into the state to provide food, emergency shelter, aid stations, clean up kits, mobile kitchens and counseling to the tornado victims. Oklahoma City resident Alicia Sullivan, who has been following news of Monday's disaster and the outpouring of donations through online social media, is among those concerned that message is not being shared. Borrego responds that if people wish to donate to their local chapter — the Oklahoma Red Cross — they should do so via their website. She said she believes the agency clearly expresses how it will use donations sent via text message. “We tell people to donate to disaster relief so we can then determine how those funds are used to support communities when they are needed most,” Borrego said. 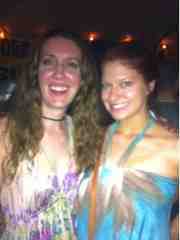 My high school friend Jaclyn Allen is a news reporter in Denver. She has traveled home to Moore to cover the tornadoes. Here is the first news story I've seen from Jaclyn. 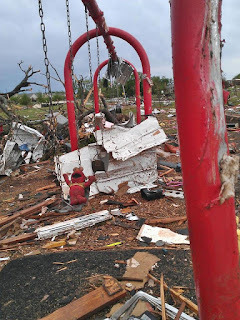 I'm getting a number of questions from friends this morning who have just heard about the tornado in my hometown of Moore, Oklahoma on Monday night (last night). First off, my family is all safe. I am unaware of any fatalities or injuries of friends. Unfortunately, I cannot say the same for friends homes and businesses. 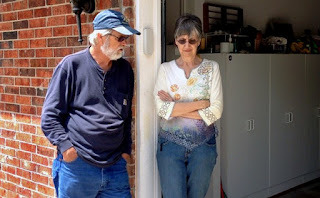 My mother and stepfather live at the end of a cul-de-sac. Their house is near the intersection of SE 4th Street and Bryant Avenue in Moore, across the street from Veterans Memorial Park. 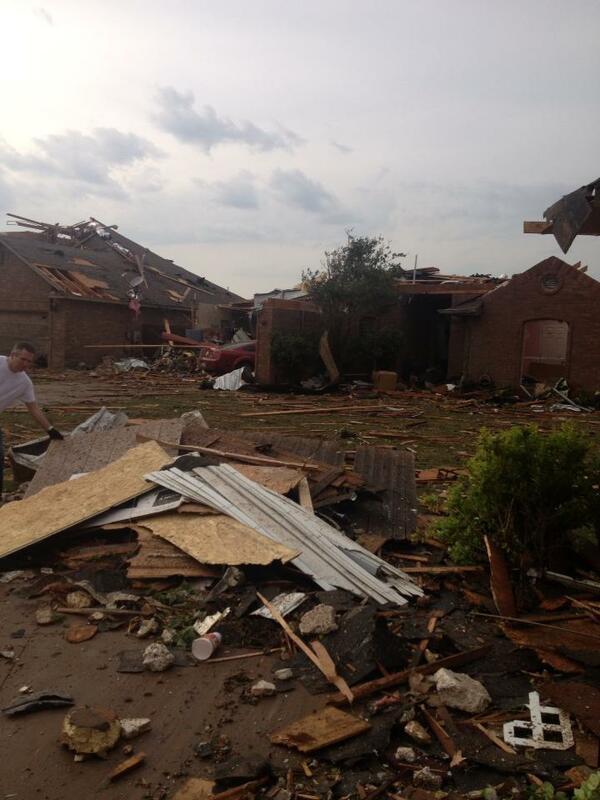 The tornado came through their cul-de-sac, but did not hit their house. Unfortunately, this is making it difficult for them to leave from a logistics perspective because the power lines are down and there is considerable debris. It has also started to rain today. They are still at home, trying to clean up and prepare to be gone for a while (weeks?). They do not have running water or power and will not for the foreseeable future. They report that they have a case of bottled water, so that's good news. My stepfather said that he has ripped down part of their fence to park their cars in the backyard. I assume this is because the damage in the neighborhood faces the front of their home. 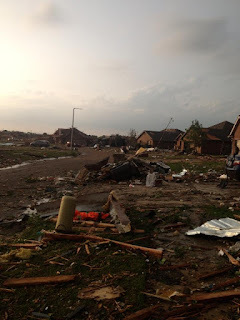 I have numerous friends whose homes and businesses were completely destroyed. I've known many of these folks since kindergarten and feel very sad that they've lost everything. I also just got word that the farm where I rode horses growing up was completely destroyed. As many of you know, my "sport" when I was younger was riding horses and that's where I did it. 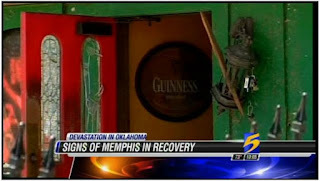 I've also heard that the Dan McGuinness in Moore (opened by a number of Memphians) was hit and will be bull dozed down fairly soon. 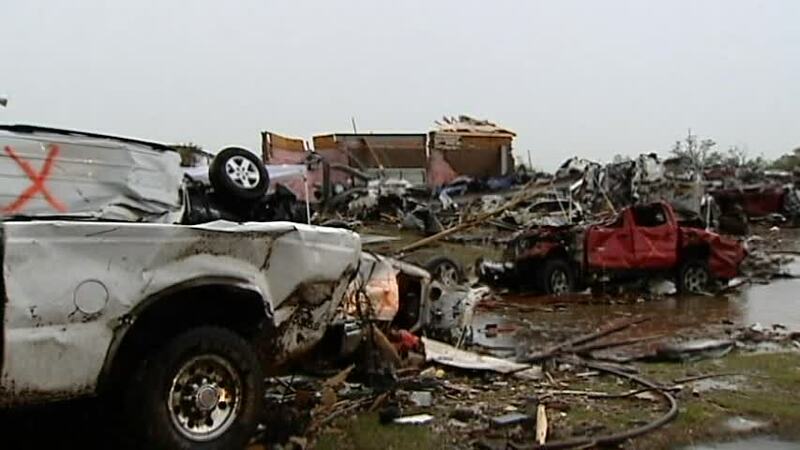 Sunday night, there were also other strong tornadoes that traveled east to Shawnee, Oklahoma. Shawnee is where I was born, and is where my grandmother and father still live. 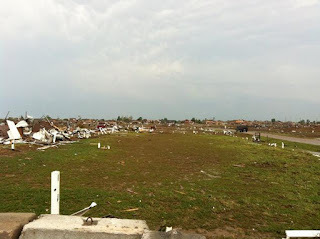 Those tornadoes were very close to my grandmother's home and leveled a number of homes near her. 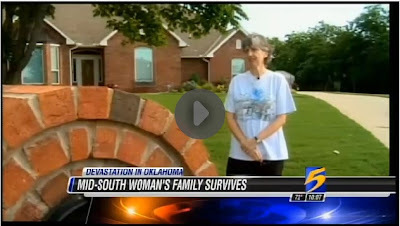 Luckily, it did not hit her house and she was able to make it to her storm cellar in time. My brother Chris and his wife Kayla purchased a house near Oklahoma City a few weeks ago, but fortunately it was not near the tornado's path. Kayla's family who lives in Moore is also okay, but her sister's boyfriend was not as lucky. Although his family is safe, they completely lost their home. I've gotten a number of questions about where to make donations. I recommend not donating to a small group that claims to be taking up donations. They are not always honest. If you want to donate immediately, I recommend the Red Cross or the Regional Food Bank of Oklahoma. This Facebook page has instructions on how to donate to these organizations: https://www.facebook.com/MooreTornado. What I really recommend though is the Moore Public School system. The school system provided me a lot of support growing up that I needed to take things in my life to the next level. I know that they will need a lot of support now to get back on their feet. 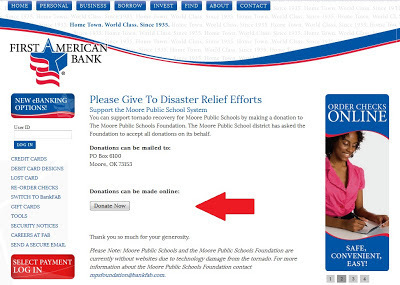 I'm working to get information on how to donate to the Moore Public Schools. Unfortunately, their administration building was also hit, so it may be tomorrow before I can share a donation address. I've seen a number of folks say, "thank goodness everyone is alive." I understand what they mean and I agree, but I always think it's sad when just being alive is the bar we're aspiring to. Many of the people in Moore have lost everything. EVERYTHING. They may or may not have any insurance that may or may not pay for the damage. Starting over with just the clothes on your back cannot be an easy task, so I would strongly encourage you to contribute if you feel compelled. Also, I'm tossing around various ideas of how to help - one being a fundraiser to support the Moore Public School System here in Memphis. Memphis community, if you are interested to help me, please send me a message. I will do my best to post updates here. Below are a few photos. I think my parents will be sending more photos once they are able to get out, and I will do my best to post them here. This is the street in front of my junior high school, Highland East. My parents live just down the block from this. A friend's home that I've known since Kindergarten. I'm not posting names for the sake of their privacy, but I want to share with those outside of Moore how bad the devastation is and how personal it is for people there. Another friend who I have known since elementary school lived here. A friend's childhood home where her mother was during the storm. She made it out safely. Check back for more updates. Again, if you are in Memphis and would be willing to help out with a fundraiser for the Moore Public School System, please let me know. BBQ Fest day 3 was a success. My team competed in the sauce and exotic categories yesterday. I spent tons of time roaming the park with old friends and new. It was another day filled with miles of walking. 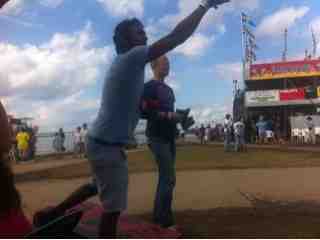 And, I played what I think may be my first ever full game of corn hole. For those not from Tennessee, corn hole is a game where you toss beanbags onto a board that has a hole cut in it for points. I did pretty well! 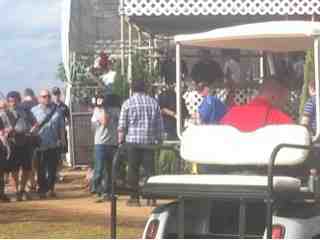 I also saw Man V Food taping again. Below is a photo of their shoot. I think all of the walking, the heat, and the bourbon finally caught up to me though. I'm writing this post from bed. After being in bed for 13 hours, I finally feel rested and ready to conquer BBQ Fest day 4. Today is the judging for our ribs, so we have to lay low until 2 PM or so when it's over. Then, it will be time for our annual crawfish boil. It comes just in time because I think I was about to turn into a piece of barbecue. I've had BBQ every day all day since Monday (thanks to a few visits to the BBQ Shop and BBQ Fest). Tomorrow is load out and the Grizzlies first game in the finals. BBQ Fest day 2 was also a success. As expected, it was far more social than day 1. I woke up around 10 am and made it to the festival around noon. Lunch was served around the time I arrived. It was BBQ and nachos. After lunch, a friend made me a manhattan, so the bourbon drinking started a bit early. We took a long walk around the park and met many different trams including BBQ Republic, Moody Ques, and Voodoo Que. Around 5 PM, I ran home to change into jeans. When I returned, it was time for another delicious BBQ meal. After dinner, my friend Jennifer and I made a huge lap around the park. We saw old friends and made new ones. It was very fun. While we were walking, we stopped by the Seed Hatchery graduation party. Pitch day was yesterday and all of the teams were celebrating. We eventually made it back to my team's tent. 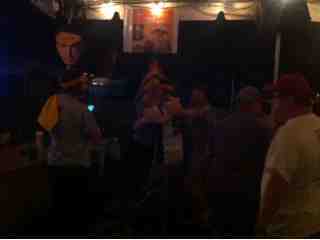 The team had cleared away the tables to turn the tent into a dance floor. A number of my friends stopped by just as we arrived which was great! The entire day was a lot of fun and very social. I would guess that I walked about 5 miles or so yesterday. My hurting feet would agree. I will be heading back down in an hour or so for more fun. But definitely in more comfortable shoes. The first day of BBQ Fest was a huge success. Wednesday night is friends and family nights for the teams. I spent time with my team at our Born in the Q S A tent. My friend Angie joined me for dinner. We had grilled chicken, greens, lots of sides, and desserts. As expected, we had Ghost River beer on tap in the tent. I brought the strawberry cupcakes with cream cheese frosting that I made. When I left last night, all 24 of the cupcakes were eaten, so I will declare that they were a success. I made them with all natural ingredients, so they were less bright looking and less strawberry tasting than what you typically see with strawberry cupcakes. Makes me think I should steer clear of bright red cupcakes in the future. Weird to think of how many additives they usually have. Anyway.... After dinner, we took a walk and ran into Freddie and Prasad. In total, we checked out quite a few teams, including Moody Ques, Voodoo Que, and the Danish National Team. 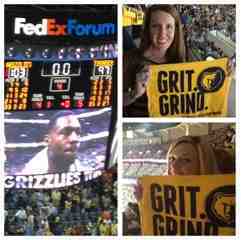 We eventually made it back to my tent for the Grizzlies Game. It was a nail biter. Thank goodness we didn't end up in overtime again. As you probably know, we won the game. This means that we will now be competing in the Western Conference Finals. Go Grizzlies!! Just after the game finished at around midnight, we were promptly ushered out of the park. I came home to rest up for the remaining days of the festival. It's going to be a fun one! 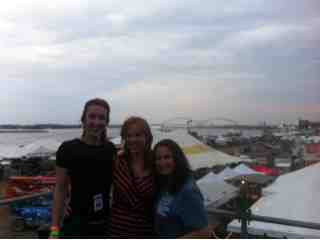 Memphis in May produces one of my favorite events in Memphis: Barbecue Fest. 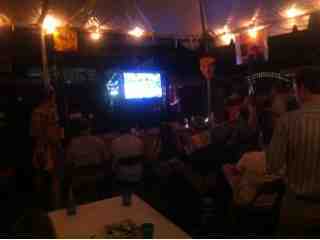 The Memphis in May World Championship BBQ Cooking Contest is like the Super Bowl of barbecue. It brings people from around the glove to Memphis to celebrate what we do best in Memphis: barbecue. Memphis barbecue is made using pork, and we are known for using a special seasoning called dry rub. Our ribs are often called "dry ribs." 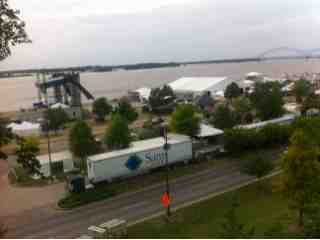 Starting last weekend, barbecue teams started to setup shop along the Mississippi River right next to where I live. There are hundreds of teams and each team sets up a tent that's just for their team. The park opens tonight for friends and family night and the event will go on through Saturday. There is judging that happens during certain times, but all week is like a big party. 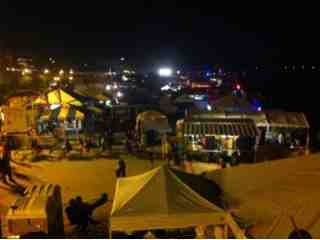 And, each tent or team is its own private party. 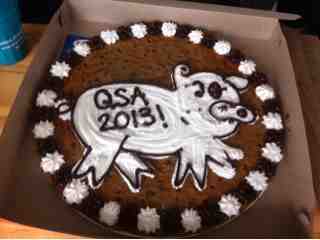 I'm a part of the Born in the Q.S.A. team. I've been on the team around 4 years and our specialty is ribs. 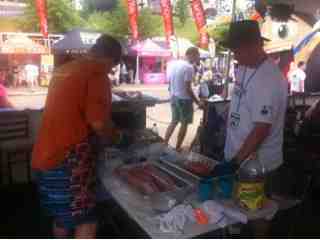 Last year, we were around 14th place for ribs (which is pretty good!). I really love the team. They are fun, but also organized and relatively low key. It's the perfect home base at an event like BBQ Fest. I'm in the middle of making strawberry cupcakes for friends and family night, so that will be my first priority after this post. When I started to make the cake part last night, I realized that I didn't have any eggs. After tweeting about my egg dilemma, a friend actually dropped eggs by my front door an hour or so later! I was able to complete the cupcakes late last night, and today I will just make the icing. I hope they come out okay - it's my first stab at strawberry cupcakes from scratch. One other exciting BBQ thing happened this week that I haven't mentioned yet. My friend Eric from The BBQ Shop invited me to be in a commercial yesterday morning. It was by far my most fun and tasty TV appearance to date. I sat at a table with a number of other Memphians, and together we chowed down on delicious ribs, nachos, barbecue spaghetti, and more. I look forward to seeing the commercial on TV and big thanks to Eric for inviting me! Below is a photo of me and Eric after the shoot. That's all for now! 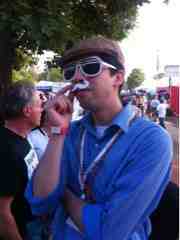 I will try to keep you posted on the BBQ Fest as the week goes along. If you live in the US, you know that the Memphis Grizzlies basketball team is in the play-offs against the Oklahoma City Thunder right now. In order to win the series, we need just need to win one more of the final two remaining games. If we win the next game tonight in Oklahoma City, we won't even need to play the final game. As you may or may not know, Oklahoma City is my hometown, so I typically dread these games. It's like my Facebook news updates are on fire, with friends in both cities writing about it and posting photos non-stop. The question I'm often asked (and you may be thinking) is which team I root for. Let me put it this way - I've now lived in Memphis for about 10 years. I moved away from Oklahoma in the late 90's. The Thunder relocated to OKC about 5 years ago. As much as I love Oklahoma, Grizzlies have just been my team for longer than OKC has had a team. In fact, they moved to Memphis the year I did, in 2001, and a number of the players have live in my neighborhood. In fact, I believe Shane Battier lived in my building at one time, years ago. Sunday night, I went to workout at my gym downtown. On the way home, I passed by the Westin and thought about how much I've been wanting to have the mac & cheese at Bleu. It's one of my favorites in Memphis, and I hadn't had it for about 2 months. I pulled up to the Westin and asked the valet if the restaurant was closed. To my surprise, it was open! I went inside and pulled up a seat at the bar where I ate a mac & cheese and drank a Ghost River beer (our local beer here in Memphis, brewed just a few blocks from my house). A very energetic New Yorker sat down next to me. He was in Memphis for work, and had heard only bad things from the locals. Everyone had told him that the city was boring and that there was just nothing to do, so he hadn't ventured out. To make matters worse, he works for the NBA. He was here for the play-off game. I felt bad that all of the locals had given him such a negative impression. I talked to him for a while, and ended up taking him for a mini Memphis tour on Monday before the big game. I picked him up at the Westin around lunch time on Monday. We drove down Madison to see many downtown shops and the medical district on our way to The BBQ Shop. My friend Eric met us there. The BBQ Shop is his family's business, and he gave us the VIP treatment. He sat down with us to tell us all about the menu, and give us some history (and positive things to say) about the city. Thanks Eric for your help, and for always being so positive. After lunch, I drove my new friend back downtown to check out the view from the top of the Madison Hotel. The Madison is a boutique hotel in Memphis. They recently renovated their rooftop bar. The new roof looks amazing, and of course has a wonderful view of the Mississippi River. I had to take my new friend back in time for the game, but I think that he may have changed his mind about the city in just a few hours. As a reminder to everyone-- every city has its faults. When you're traveling on business or on vacation, you're looking for a few bright spots. It doesn't do them any good to hear about the long list of things you don't like. As someone who lives in the city, take the opportunity to share those bright spots with the visitors you meet. These details are the ones that are really helpful to someone who's traveling. Special thanks to everyone who helped out with ideas on things to do, including Eric Vernon, Paul Morris, Eric Mathews, Devin D., and Krista E.
After dropping off my friend, I headed home. 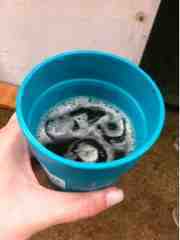 An hour later, I was hosting friends on my roof for pre-playoff-game mojitos using the fresh mint from my garden. About 10 people or so came up. The weather was perfect, and the drinks were good too. It was really nice to see everyone and to reconnect. We should definitely do it more often, and use as much mint as the garden will produce! 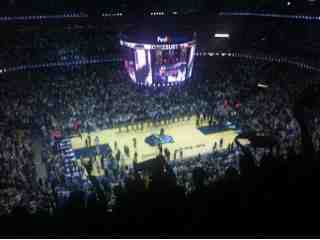 The next stop was the FedEx Forum. I had planned to watch the game from a bar downtown, but a very thoughtful friend had given me two free tickets just a few hours before. August and I went for what was one of the best and hardest games of the season. We were down by quite a bit at first. Then we recovered and the score went back and fourth for quite a while. We would be up by one and then they would. Eventually, we won in overtime. August and I were both so happy to go to the game in person. It was also nice to be there with friends. A number of friends were all over the arena including Cindy who was 3 rows back from us, a high school friend, Jamie, who had driven in from Oklahoma City to cheer on the Thunder, and my friend from Singapore (it was his first NBA game ever!). After the game, we headed to a local pub called Bardog where I destroyed (quite literally) a club sandwich and a beer. We saw many of the folks who are going through the current Seed Hatchery incubator, my friend from Singapore, Freddie, and Prasad. Freddie had just landed in the Memphis airport from Norway. He's such a good sport that he came right out to meet us. It was great to see everyone. It was definitely a successful day for Memphis!